From time to time, gas logs need refurbishing to bring back their realistic appearance; the high temperatures of a fire will wear away at any log set, whether it is concrete or ceramic. This 8-ounce tub of rock wool helps you create "glowing embers" once again in your fireplace, be it natural gas or propane. Replacing the entire gas log set can be very costly, but for less than $15, you can bring your gas logs back to life. Can I use this with LP gas Vent-Free logs? This can only be used with vented sets. 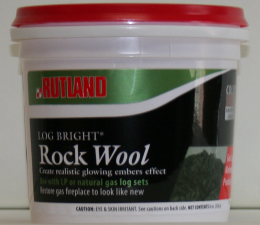 Is this Rutland log bright replacement gas log rock wool OK for use with a vent-free fireplace system? No, this rock wool is not approved for use with a vent free unit. Is this for a vent free fireplace? No, rock wool or ember kits should never be added to a vent-free fireplace or ventless log set. Only manufacturer-approved accessories, made specifically for the vent-free burner, should be used. What is the best way to apply Rock Wool to my gas fire place logs? The rock wool should be spread beneath the logs and just in front of the burner tube, out to the floor of the fireplace where the burner stops. Is the rock wool strictly a visual effect or does it enhance the efficiency of a natural gas fireplace insert? The rock wool is strictly decorative and only serves to enhance the appearance of the log set. If your existing wool has ceased to glow or is otherwise deteriorating, it will need to be replaced. Is this rock wool for ventless fireplaces? No, this rock wool should only be used with vented gas log sets. Dose this rock wool work with propane? Yes, this item is suitable for use with either natural gas or propane vented gas log sets. Can this be sprinkled on top of the ceramic logs to make them glow? Certainly. You may need to experiment with the placement of the wool, as it will only glow when it has reached a very high temperature. Close contact to the flame will be necessary to achieve the effect. Is this for vented or ventless gas log sets? This item is intended to replenish vented gas log sets. This product is great in that you have the quality of an improved fireplace with the guarantee of enough to last an added few years. It is easy to use, looks nice, and only takes a couple of ounces per fireplace. I highly recommend this product to those looking for something to renew their fireplace efficiency and look. This product goes a long way and is made with the utmost quality in mind.